Who Else Wants A Push Button Solution To Video Creation Without Paying Through The Nose? As a video marketer I'm sure you know..
* Video Is NOW, The Future, And In It's Infancy WITHIN The Online Realm. * PPC Search Is Becoming Extremely Saturated, Is Always Competitive AND The Younger Generation Avoids Online Ads Like The Plague! * Videos Can Go Viral And SlideShred Videos Makes That Happen Very Easily With Our Social Media Leverage At Over 75 High PR Sites! 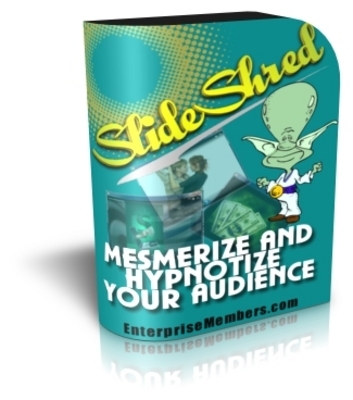 * SlideShred Videos Are Very Creative, Completely Unique, And Like Napoleon Hill Said, "Creativity Knows NO Competition"
* Social Media Traffic=AWESOME Traffic. If Someone Likes Your Video They Spread It Like WILDFIRE! * Even If You Don't Like Being In The Camera, You Can Get MASSIVE Traffic From Video And That Traffic Is More Likely To Convert After Being PRESOLD By Your SlideShred Videos! * You Can Easily Grab A Slice Of The Traffic From ANY Of These Niches With Your SlideShred Video Working 24/7 For YOU!